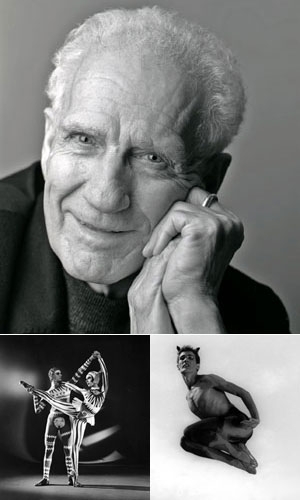 Grant Strate (December 7, 1927-February 9, 2015) dancer, choreographer, educator . A graduate of the University of Alberta who studied dance with Laine Metz, a student of the influential German expressionist Mary Wigman, Strate was a charter member of the NATIONAL BALLET OF CANADA as a dancer in 1951 and was resident choreographer from 1964 to 1970. He was guest choreographer in Antwerp (1966-67) and with the Royal Swedish Ballet (1968-69). Among his more than 50 ballets for many companies are Ballad and The House of Atreus (music by Harry SOMERS), Bird Life and Cyclus. Grant Strate’s choreography brought an original Canadian perspective and a modern dance aesthetic to the repertoire of the National Ballet, but his contribution as an educator and nurturer of choreographic talent has been even more important for the development of Canadian dance. Inspired by his experience as guest teacher at the Juilliard School in New York City in 1962-63, a time of great artistic ferment, Strate fostered and facilitated artistic experimentation, the explosion of independent dance in Canada, and the development of DANCE EDUCATION. He was founder of Canada’s first degree program in dance at York (1970) and of the Dance in Canada Association (1973), organizer of National Choreographic Seminars (1978, 1980, 1985, 1991) and director of Simon Fraser’s Centre for the Arts (1980-89) and the Contemporary Arts Summer Institute (1985-95). He became professor emeritus in 1993. Strate’s numerous honours include the Jean A. Chalmers Award for Creativity in Dance (1993), the Order of Canada (1995), the Governor General’s Performing Arts Award (1996), and an Honorary Doctor of Laws Degree from Simon Fraser University in 1999. Artistic advisor to the Sichuan Dance Academy in China since 1994, he served as a member of the Dance Advisory Committee for the Canada Council (1993-97), has been a director of the Vancouver Dance Foundation since its inception in 1995, and began a 4-year appointment as president of the World Dance Alliance – Americas in 1999.